I am a huge fan of nature and wildlife documentaries so when I saw the BBC trailers for ‘Monkey Planet‘ I was giddy with excitement. I find monkeys fascinating and enjoy finding out more information that can help me to understand them more. The first episode ‘Meet the Family’ showed the great range of primates and how they have adapted to environments across the planet. I was amazed by how many primates are out there (which I had no idea about!) but also that sloths and lemurs are considered primates themselves! The second episode ‘Family Matters’ was brilliant! Again, the documentary showed a range of primates and how they operate and communicate in a different ways, but they do so as a family. The episode highlighted that the key to their survival in the wild is the close-knit relationships. The primates that particularly stood out to me were the vervet monkeys in South Africa. This is for several reasons the main one being Oyster has a project in South Africa which works with the vervet monkeys but also how clever they are as a family. During the episode Dr George McGavin (presenter of the series) plays vervet monkey audio ‘callings’ off his phone which revealed amazing results! It turns out the vervet monkeys have a refined alarm system to warn others of predators. He showed a few examples which were extraordinary, he played the alarm for snakes and in an instant the monkeys all stood up and looked towards the ground, he then played an alarm for bird predators where they all jumped for the trees and placed themselves deep within branches to protect them from birds which could swoop in from different directions. He went on to explain this alarm system only works through trust between the monkeys and learning from each other. This starts from birth. Like humans, primates are one of the only other animals to care for their babies for a long period of time. The babies initially need close interaction this is where they learn and understand the trust element. As they get older they become more curious and this is where the learning element comes into play. They observe their fellow families behavior, and begin to leave their mothers side were they play and interact. After watching this I realised more so than ever before how valuable Oyster’s South Africa monkey project is. 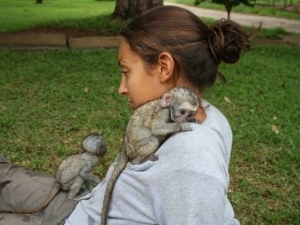 The centre cares for orphaned vervet monkeys and the volunteers act as a surrgant parent where they bottle feed them as they snuggle up in their arms just like they would with their natural mother. The volunteers also spend time with the older monkeys encouraging them to play and interact with each other, just like they would in the wild. Once a family unit is established the human interaction is gradually decreased and thus begins the rehabilitation process to get them back out into the wild, where they will hopefully go on to live a happy and normal life as seen on the documentary. The third and final episode ‘Master Minds’ showed Dr George McGavin exploring the incredible minds of primates and highlighting just how intelligent they all are. This included the way the use tools for example the long tail Macaque will use human hair as floss to clean their teeth, apes using sticks to retrieve honey from trees and others using rocks to crack open nuts and shellfish for food. However, Dr George McGavin argues that primate intelligence goes beyond working out how to use tools and that it actually emotion that really separates primate intelligence from other animals. The episode displayed rhesus macaques climbing a very tall building and jumping into a water trough to play, show-off and for the mere adrenalin rush. The episode also showed apes showing sympathy/empathy for one another if hurt and monkeys also lying / tricking each other in order to gain an advantage during feeding time. The third episode also showed Orangutans and revealed that Orangutans will stay with their mothers for up to 10 years! During this time they will learn skills to survive including how to climb, what they can eat and how they can eat. But Dr George McGavin pointed out the sad truth that due to hunters and cutting down forests many Orangutans are being killed, including mothers who need to pass on their crucial knowledge to their young. But thanks to rehabilitation projects (like our own Orangutan project in Borneo) humans are helping to save this fascinating species from the brink of extinction. If you would like to see the episodes you can watch them on iPlayer now. Previous Post A day in MAX4 – ski lessons for adults, where less is definitely more!